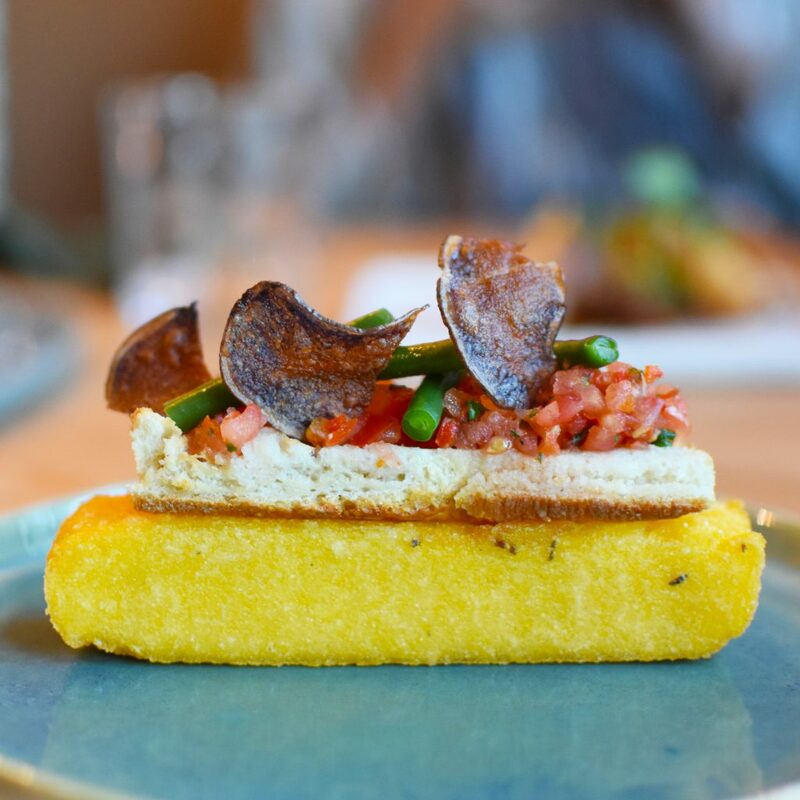 Below are my food recommendations for my new favorite city in Brabant, and while you’re there don’t forget to visit De Pont, a great modern art museum. 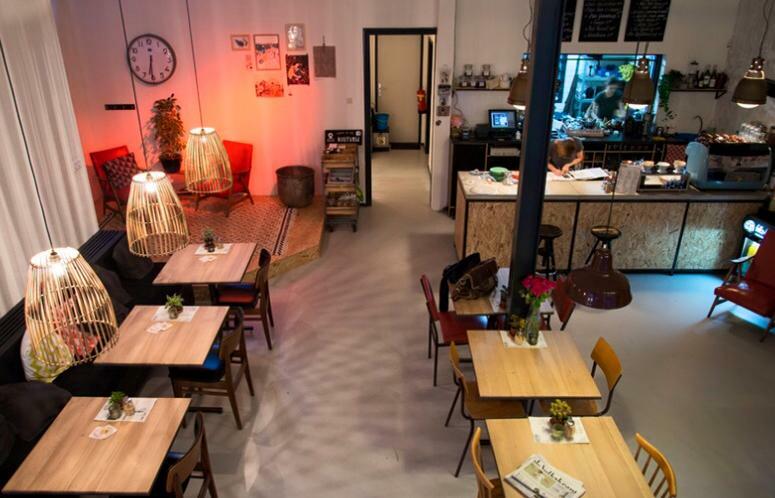 Buutvrij, a creative coffee shop, can be your first stop in Tilburg. They don’t have an extensive menu, but you should go here to drink a great cup of coffee, get inspired by their interior and discover local talent (they display art by young designers). They’ll always have a vegetarian option and at the moment they have vegan pancakes (if you skip the honey). Buutvrij often organizes special activities like music performances, so keep an eye out on their facebook page. They’re conveniently located, on your way to the city center from the central station. Cinecitta is a beautiful art-house film theater, that also houses a restaurant called Ristobar. They’re open for lunch and dinner (and of course for drinks before or after your movie). They have many vegetarian options on the menu. For lunch you can for example go for one of the vegetarian soups or french toast with Greek yogurt and cherries. For dinner they have a delicious ravioli with mushrooms and ricotta, and my favorite vegan burger of all times: the Dutch Weed Burger. 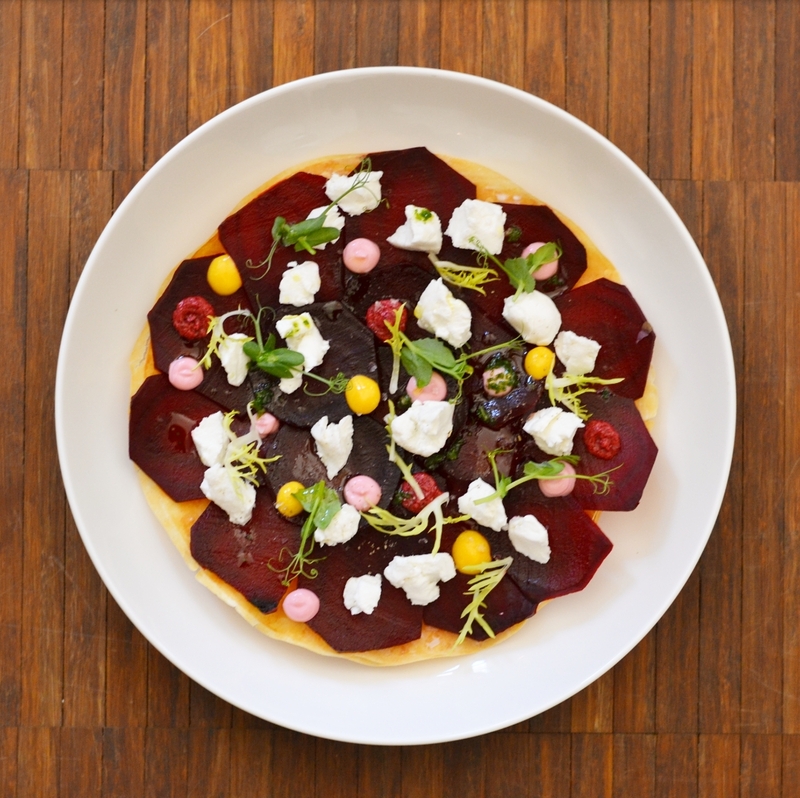 De Groene Chef is located in Bank15, close to the central station. 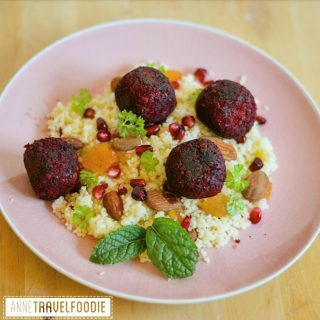 Everything on the menu of de Groene Chef is refined sugar free and vegetarian. But there’s more! The Green Chef mostly cooks with organic product and she doesn’t use any animal products whatsoever. So everything on the menu is lactose-free and vegan. Many of the dishes are also gluten free. So whatever your diet or food allergies, you can go to De Groene Chef for a delicious healthy meal! Click here to read more. A short distance away from Buutvrij you’ll find Locals. They serve a delicious lunch with local products and handmade pastries. Besides the vegan sourdough bread with homemade baba ganoush and grilled vegetables that I often take, they always have a couple of vegetarian options and a nice gluten free quesadilla with spinach and avocado. If you didn’t get your caffeine fix at Buutvrij, they also serve nice coffees here. Across the street from Locals, you’ll find Tien. Tien is a concept store selling ‘fashion, food and furniture’. If you’re looking for an original gift for someone, this is the place to be. They sell original cards, jewelry, plants, gifts and clothes. 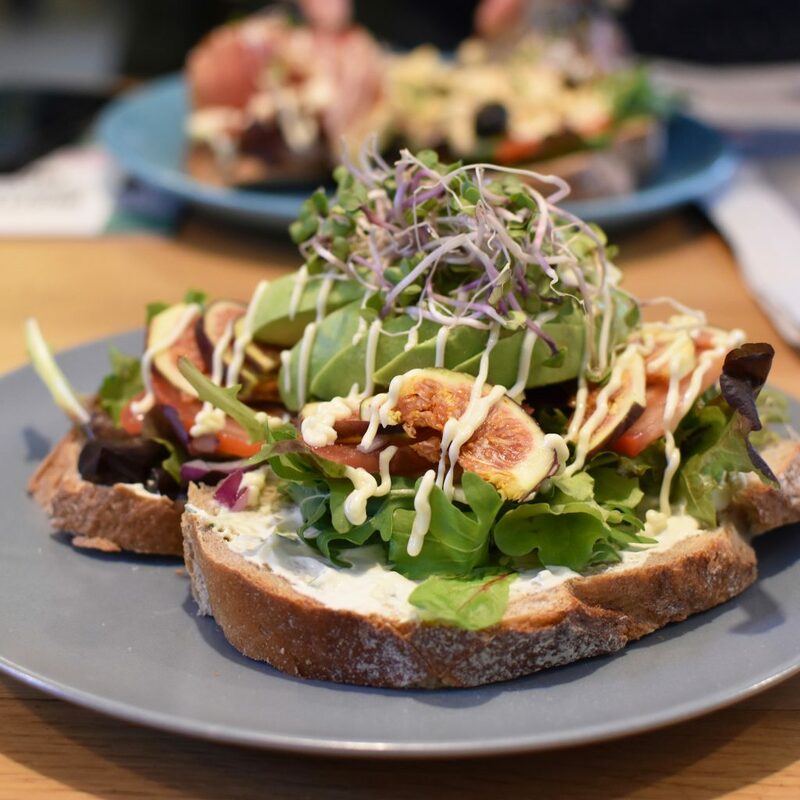 And if you’re one of the lucky ones to get a table at Tien you can have one of their delicious lunch items with many vegetarian options like a sandwich with red beet hummus and goat cheese, courgette broccoli soup or a grilled cheese sandwich with avocado and spinach (pictured above). PLEASE NOTE: while Tien is looking for a bigger space, they temporarily stopped serving lunch. 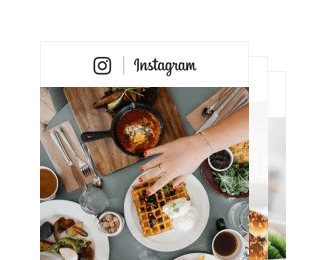 This ‘lifestyle restaurant’ opened their doors in 2015, so they’re relatively new. But what a great addition to the restaurant scene in Tilburg this is! They have a three course menu of the month for less than 30 euros and it’s almost impossible to get more value for your money. The dishes are very tasty and beautifully presented. They always have a meat, fish and veggie option. And although mostly at restaurants the veggie option is not very creative, it’s often the best dish on the menu here. Pictured is their vegetarian bulgur salad. They also have a vegan dish on every menu. When you’re dining in the Houtloods, you can literally look in their pans. Due to their ‘kitchen bar concept’, the guest will eat a bar attached to the kitchen or at one of the tables surrounding the kitchen. Located in the industrial area at the North side of the train station, the ‘Spoorzone’, their interior is a great combination of old and new with big glass walls. They’re open for lunch and dinner and their menu changes regularly. 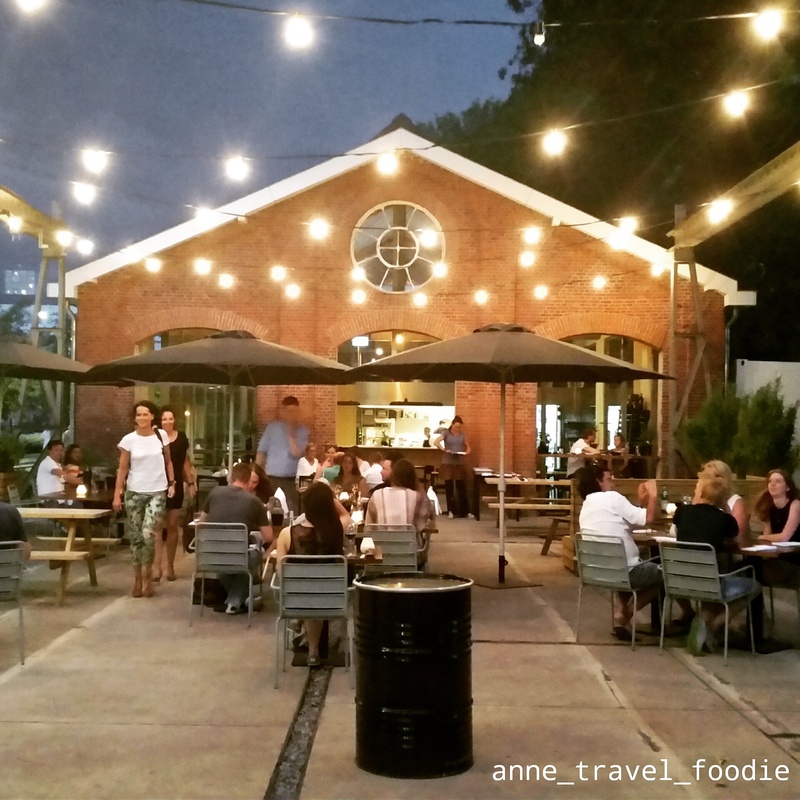 Right next to the Houtloods the owners transformed an old train wagon into a restaurant. De Wagon offers a very unique setting when you’re having dinner inside, or a sunny terrace when you’re having lunch outside. For lunch they have 3 types of pita bread (1 meat, 1 fish and 1 vegetarian). You can order one, or try all 3 of them. 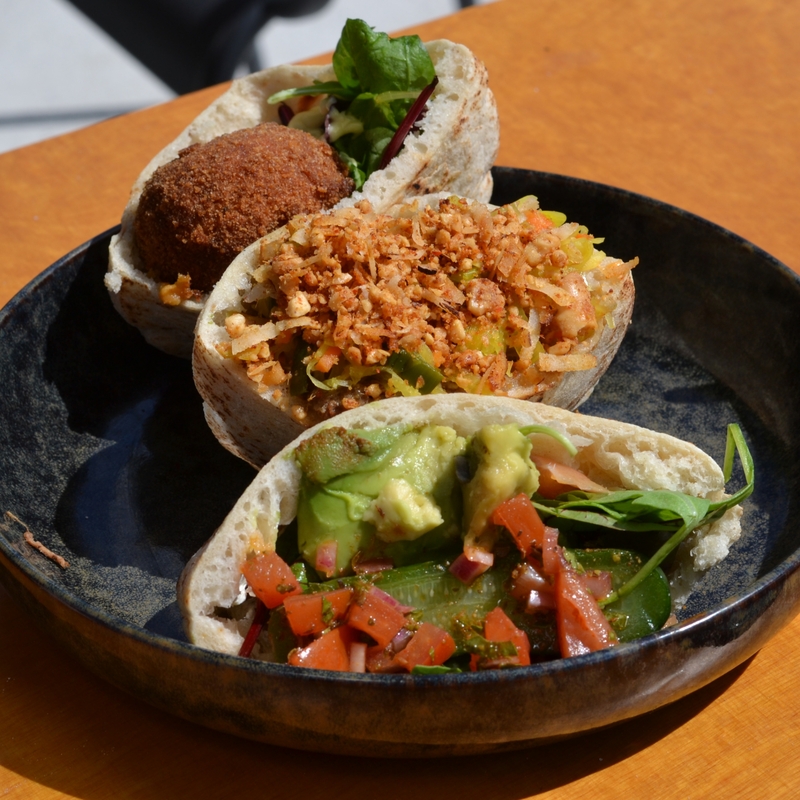 My favorite is the vegetarian (of course) with falafel and ras-el-hanout. They also have a nice falafel dish for dinner with grilled aubergine and salsa verde. Do you have something to celebrate? Or are you just in the mood for something fancy? Monarh is the place to be. 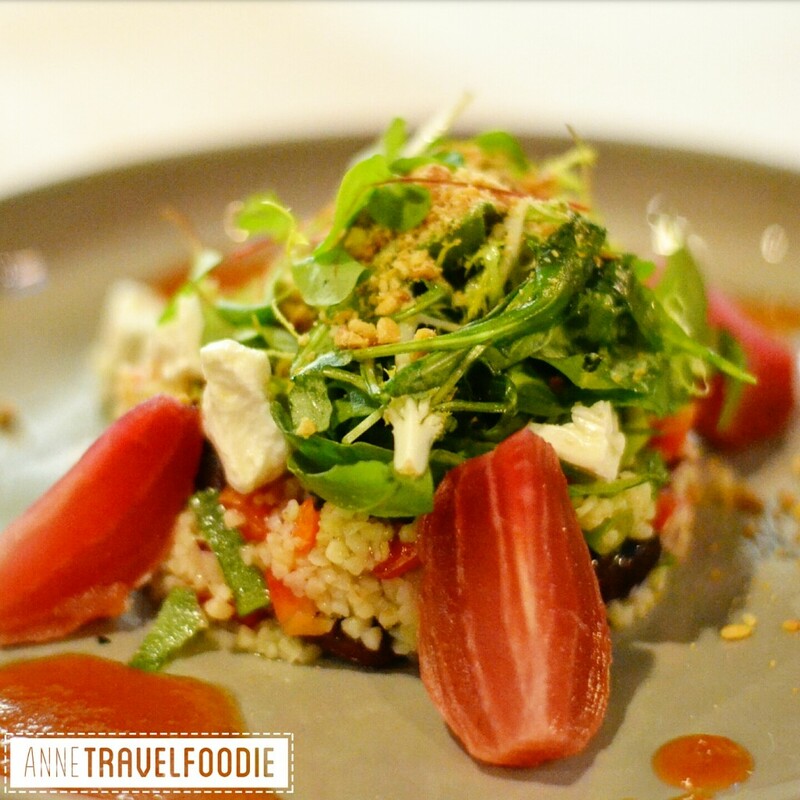 Located in an old monastery, Monarh brings your taste buds to the next level. I suggest you let the chef surprise you (you can let them know if you’re a vegetarian or have any allergies) with a ‘menu du Chef’ with wine pairing. 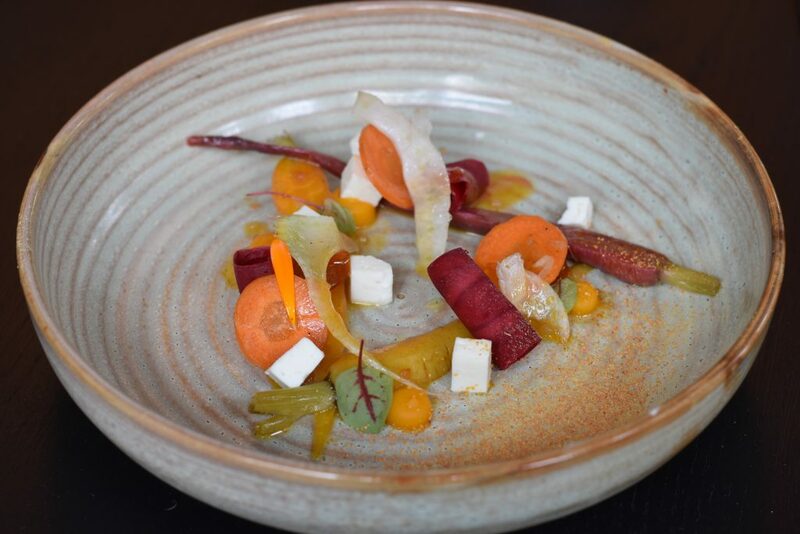 The taste and texture combinations of master chef Paul Kappé will amaze you. It’s not cheap, but considering they’re the first restaurant in Tilburg ever to get a Michelin star, it’s totally worth it. 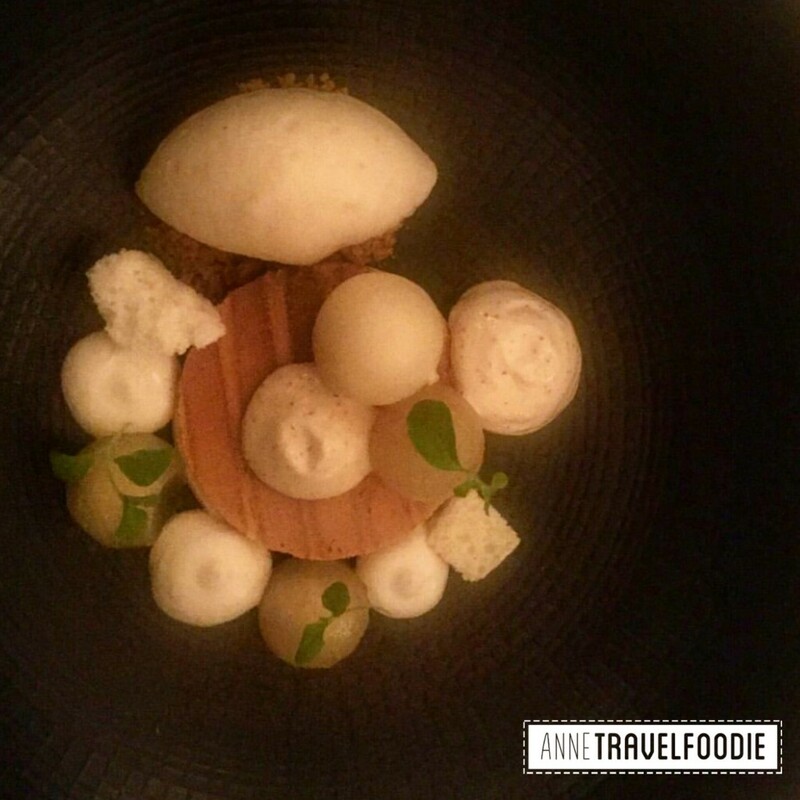 Click here to read more about Michelin star restaurants in Brabant. Speaking of celebrating, Auberge du Bonheur, or as it’s now named: La Nouvelle Auberge, is a perfect spot to celebrate! You can rent it as your wedding location, but it also has a nice restaurant that has been completely renovated in 2018. The new look is natural chic. And even though you’ll still have the feel of eating in one of Tilburg’s best restaurants, it’s now also a place where I would go for a dinner with friends. This is also because the waiters have a new look, note their fancy white sneakers when you go there! Speaking of the waiters; the staff at Auberge is very friendly and makes you feel right at home. Pleïade is an inspirational shop that has an organic lunchroom as well. Everything on the menu is vegetarian and organic and it all tastes great! Go for a soup, a sourdough sandwich or a salad. But make sure to leave some room for something sweet for dessert; they have many vegan or gluten free options! 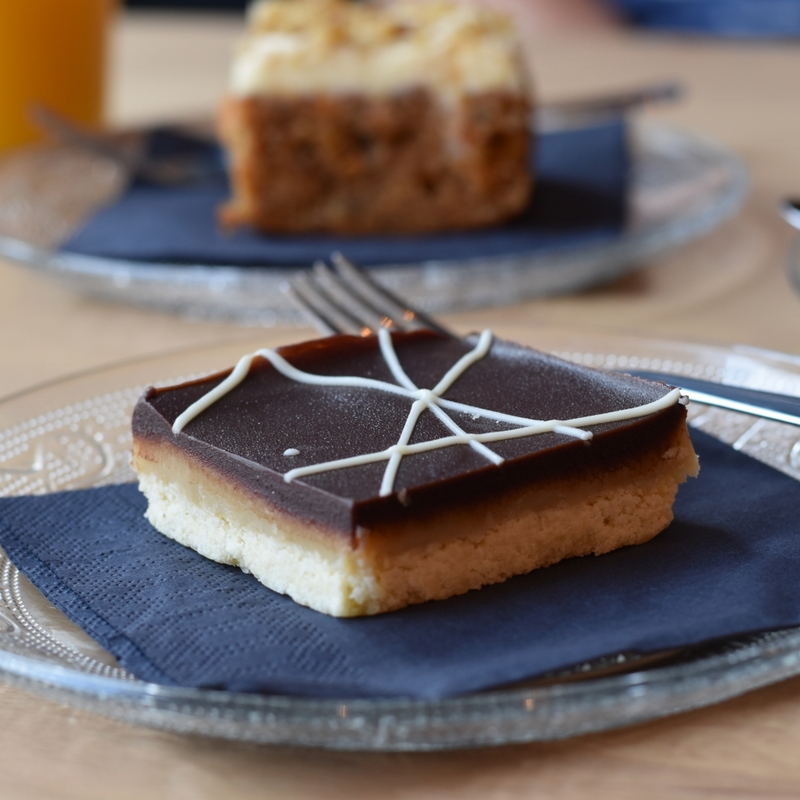 The name might not sound new to you, cafe Noir has been around in Tilburg since the seventies. But as of December 2018 it has got two new owners and a complete make-over. Whereas I wouldn’t recommend the old Cafe Noir to you, I’m a big fan of the new NOIR! NOIR is open from lunch to late. 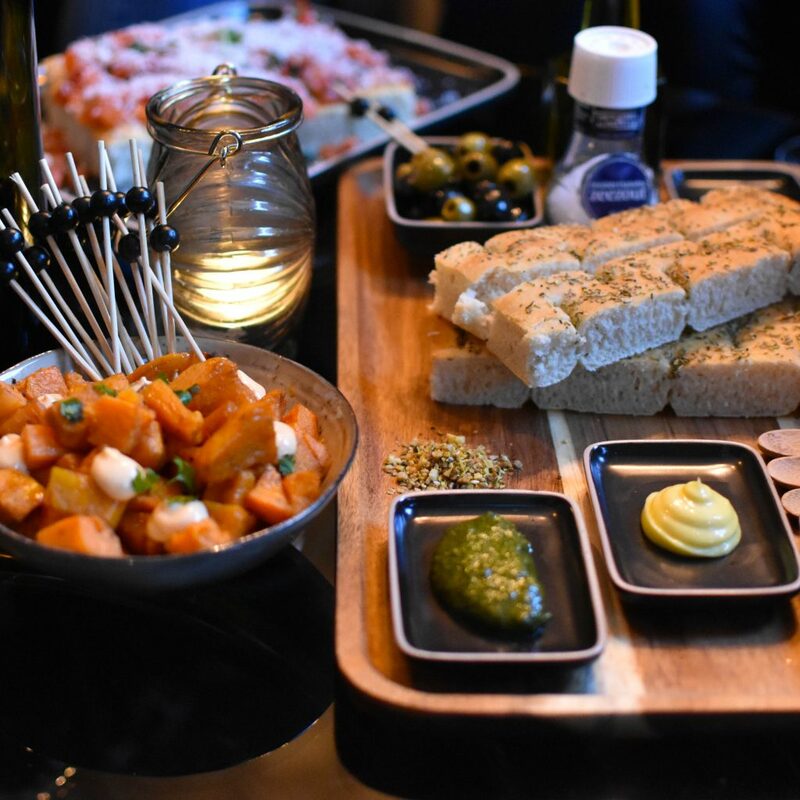 They don’t have a dinner menu but they have a ‘borrelkaart’, so they have all kinds of delicious finger food dishes that’ll make sure you don’t leave hungry. Click here to read more about NOIR Tilburg. Waanzinnig is a restaurant that mostly serves vegetarian (‘vegetarisch’) food. They have several vegan options, but also some meat and fish options. They pretty much cater everybody needs. Most of their products are local and organic. 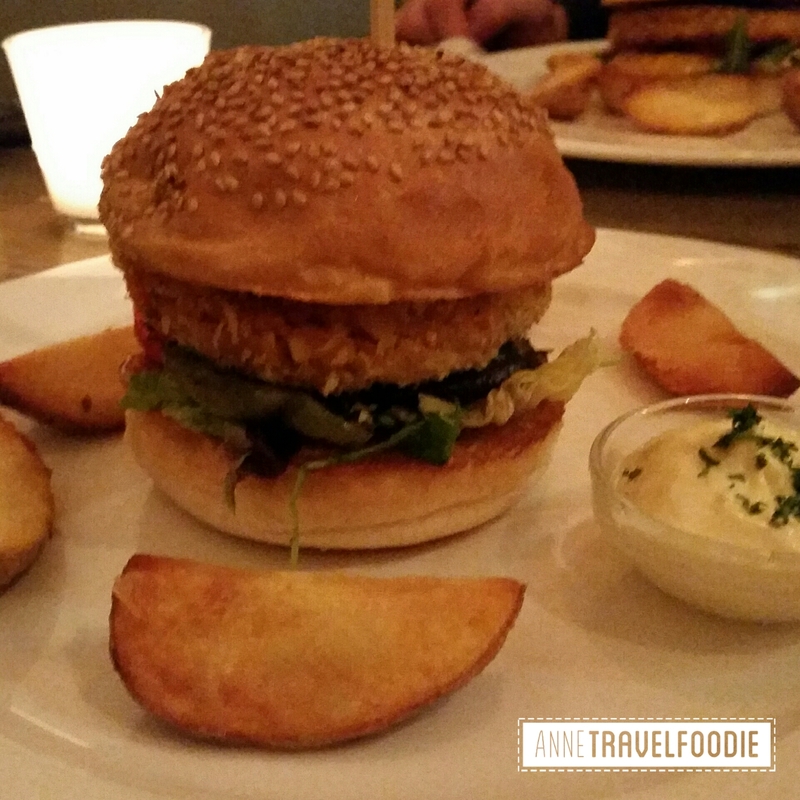 As a starter I’d recommend the falafel and as a main dish I had this delicious pumpkin burger with cranberry compote. Waanzinnig is also open for lunch, click here to read all about it. Besides sushi, a small Thai restaurant and Chinese restaurants that actually serve Indonesian food, there wasn’t any good Asian food available in Tilburg. Luckily we now have Don’s Noodle Shop! At Don’s Noodle Shop you get real good Asian food. 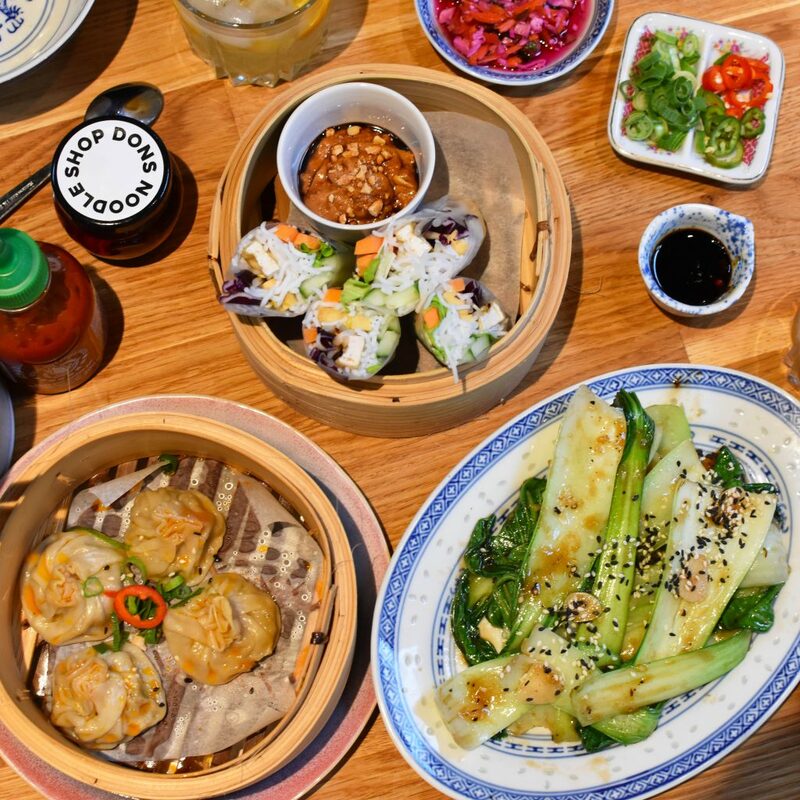 Expect dishes inspired by Japan, China, Malaysia, Indonesia and Thailand. Don’s Noodle Shop was intended as a take-out restaurant, but many people enjoy to eat their dishes in the small restaurant in the city center. Click here to read more about Don’s Noodle Shop. Tarte Tatin is a small patisserie where you can enjoy delicious cakes, pies, muffins and cookies. Owner Joanneke started as a home baker and as of April 2017 she opened up a patisserie, right around the corner of the main shopping area. At Tarte Tatin she has many sweet treats on display that you can take-out or enjoy with a cup of coffee or tea. She works with fresh products and makes everything herself. What’s on sale varies, but there are some classics that will be available most of the time like her cheesecake, lemon squares and carrot cake. Van Planten is a completely vegan bakery. All cakes are made by Ella. She doesn’t have her own bakery but sells her cakes in several restaurants in Tilburg. You can always find a couple of her pastries in the coffee corner of conceptstore Velerlei in the Nieuwlandstraat. 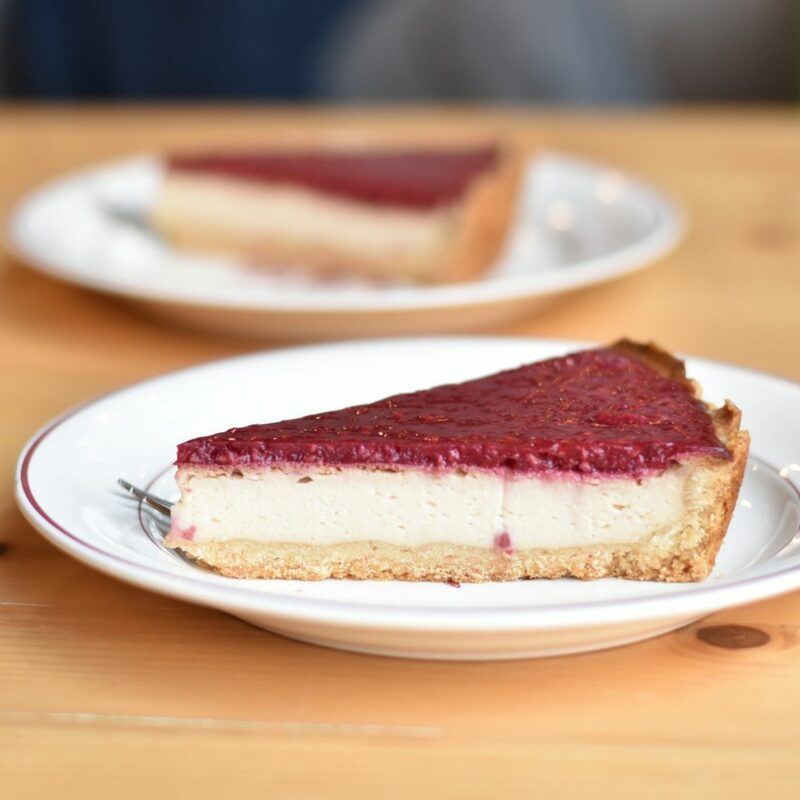 Sometimes they have this divine vegan cheesecake, but the offer varies daily. 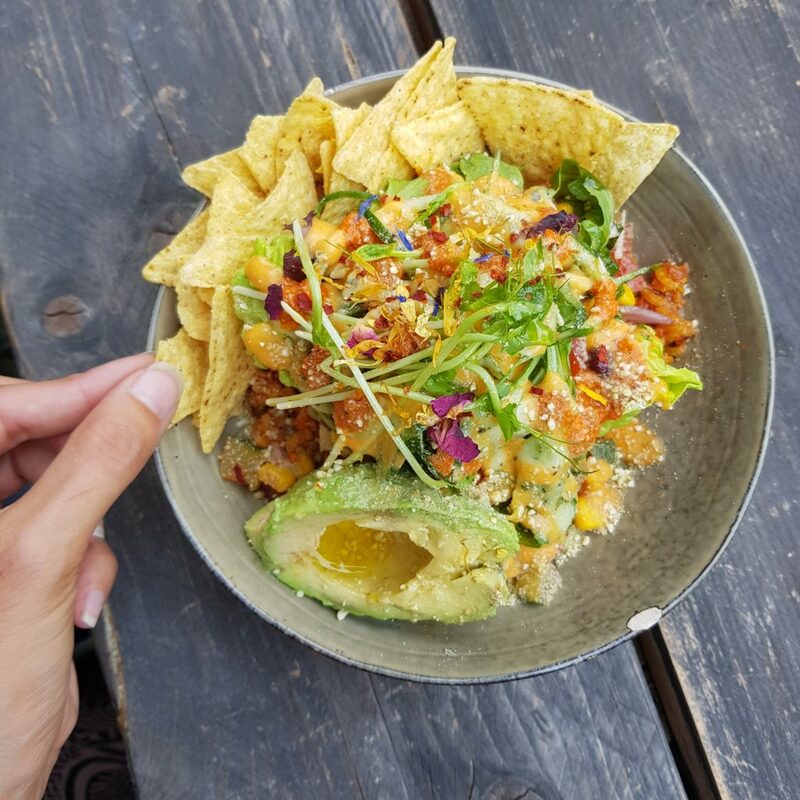 Click here for all my favorite vegan food spots in Tilburg. Club Jolie is the new project of the team from DonCurado, the Spanish restaurant that used to be housed in the building. Club Jolie is open for lunch, drinks and dinner and serves dishes from all over the world. For lunch they have several soups, salads, pita tosti’s and platters like the healthy lunch platter with yoghurt and granola, fresh fruit and orange juice. For dinner you can choose from dishes like risotto, lamb stew from Thailand and the polenta pictured above as a starter. Zoete Moed for the best cakes and home made peanut butter. Olives and spices, the couscous bar for a dish to stay or to go! Mr. Morris for sandwiches and fresh juices. 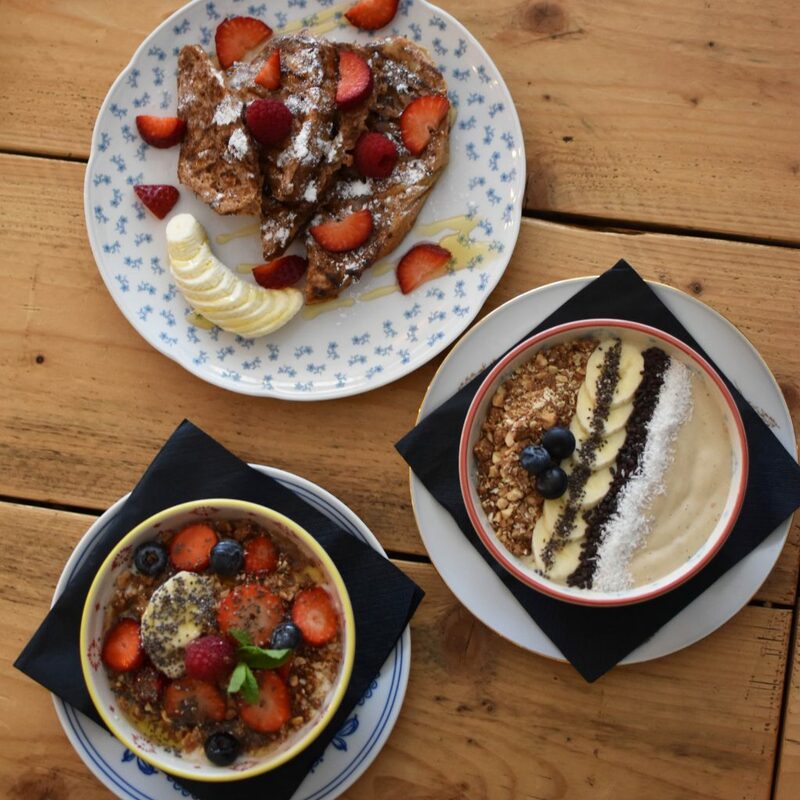 The Fat Greek for modern Greek food and delicious pancakes. Stoom013 and Eve in the Spoorzone. Studio Tat for a lunchroom in a tattoo shop. Ice Rollas for rolled ice cream. Berlijn Cafe for a cafe with bar food and a living room feel. Restaurant Rak for lunch or dinner on the water. Pizzabar Rijslust for pizza’s with toppings from all over the world. Het Wapen van Tilburg, for an affordable meal. Chocolate Company, for chocolate lovers. Grand Cafe Puur, for lunch in the city centre. 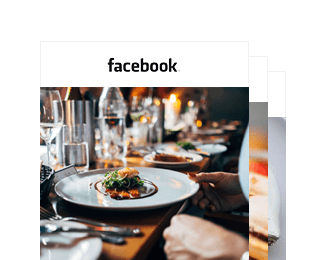 Like my Facebook page to never miss any food news. Hoi Machiel, ja ik vind Villa Pastorie en de Burgerij ook erg leuk en lekker! Bij Nieuwland vind ik de kaart helaas wat minder. Met weinig keus voor vegetariers en veganisten. Maar leuke stad, Tilburg! 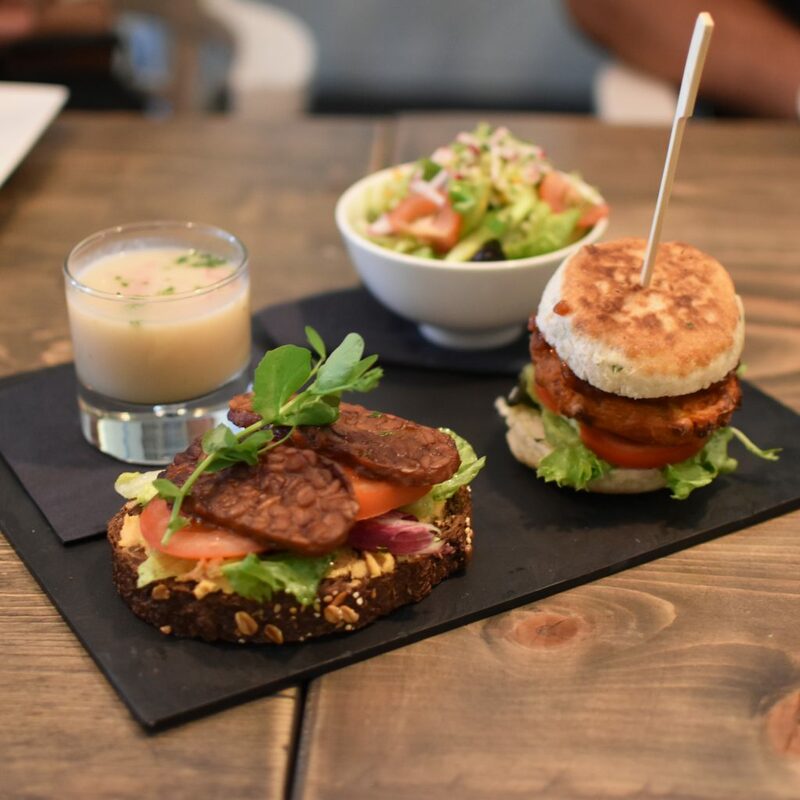 Cinecitta Ristobar heeft ook altijd enkele vegan opties, waaronder de Dutch Weedburger. Zeker een must-eat!! Hallo Anne, bezoek de volgende keer ook het Pleiade Bio-café in de nieuwlandstraat. 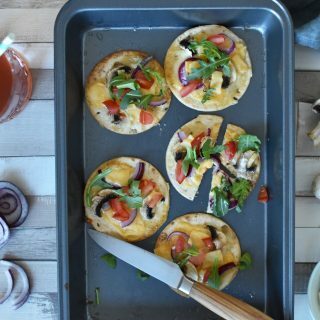 Je kan er lekker biologisch lunchen en genieten van de zelfgebakken taart, ook zonder gluten, lactose, suiker en noten. Leuk om te lezen wat je allemaal aanraad in mijn stadje! Eethuis twintig is echt mijn favoriet, heerlijk. Ik ga snel eens een kijkje nemen bij Babsmade, lijkt me ook wat. Oh en in de Willem II straat zit een tentje waar ze heerlijke vers belegde broodjes hebben, Kras. Ook leuk om eens uit te proberen! Omdat we wilden vieren dat ik een nieuwe baan heb, zijn we gaan eten bij ‘De Houtloods’. Het zes gangen verrassingsmenu is echt een aanrader. Er werd zeer goed rekening gehouden met mijn alcoholallergie. Men zag het hier als een uitdaging om gerechten aan te passen. Vaak krijg ik bij andere restaurants hetzelfde gerecht maar dan zonder saus omdat daar alcohol in verwerkt is. Nu prima alternatieven gekregen. Top! Bedankt voor de tip Anne! 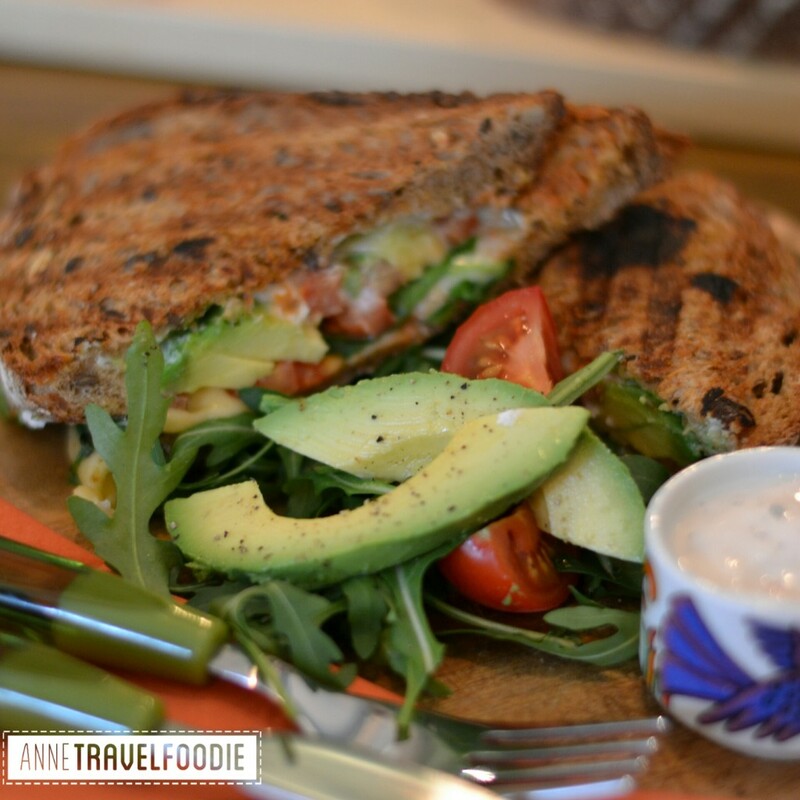 Pingback: A Local's Guide to Tilburg; What to visit and where to eat! enehh… wat is er mis met Hofstede de Blaak? Zelf kom ik er graag, hier een je ook een 3 gangen keuzemenu onder de 30,-. Mooie jachtkamer, klassiek weliswaar en fijn terras. I think this is among the most important information for me. And i’m glad reading your article. 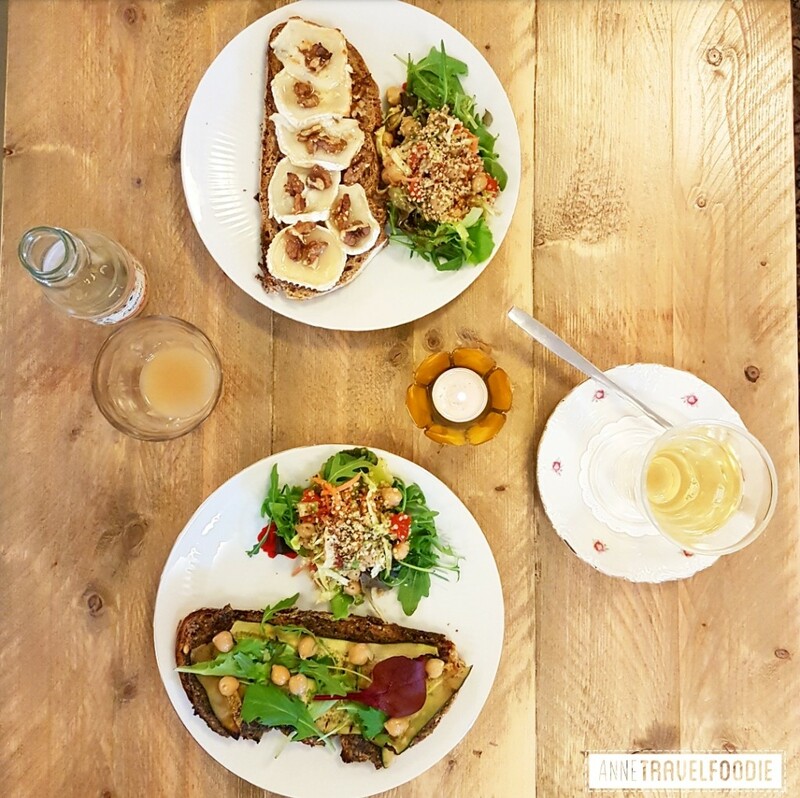 New in Amsterdam: Miss Louisa Coffee & Bei ..